During the recent IETF meeting in London, UK, Erik Nygren of Akamai gave a fascinating talk about IPv6 Trends which is well worth watching if you’re interested in where we’re at with IPv6 deployment, and where to focus attention going forward. As Erik mentions at the start of his presentation, Akamai are one of our valued data sources for World IPv6 Launch measurements. Erik’s presentation makes it clear that while there are lots of networks with IPv6 deployment well underway, there still remains a great deal of work to do. In that light it’s great to see major network operators continue to deploy IPv6 and register with World IPv6 Launch to have public acknowledgement of the scale and scope of their efforts. This month’s IPv6 network operator measurements include a recent sign-up that I’d like to highlight here. Coriolis Telecom is a French virtual network operator providing mobile, ADSL and fibre services to individuals and corporations across France. 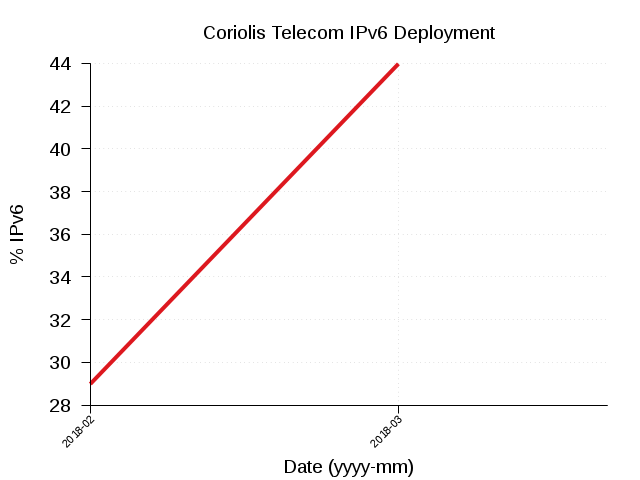 This month’s IPv6 network operator measurements show Coriolis ranked 163rd with a rapidly growing IPv6 deployment percentage of 44%. If you’re a network operator deploying IPv6 and would like to join Coriolis Telecom and the other networks that make up the ranks of World IPv6 Launch participants, please register your network for measurement.